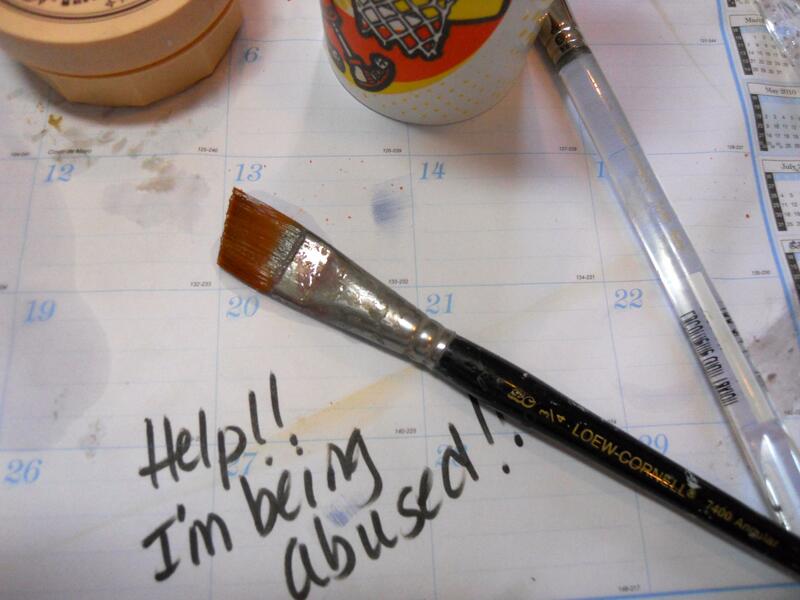 I sat down to work today and was ashamed at the way my brushes looked! I know better, was taught better, but here they were with paint in the feral, hadn’t been really cleaned in who knows how long, to the point where I actually considered turning them into ‘glue’ brushes. 1.) Determine the condition of your brushes. Do they need a DEEP cleaning? It there’s dry paint in the feral (metal part of the brush) they do. If they’re just a little dirty you could probably skip to Step 6. Overuse of the brush cleaning solution is not good for them either. 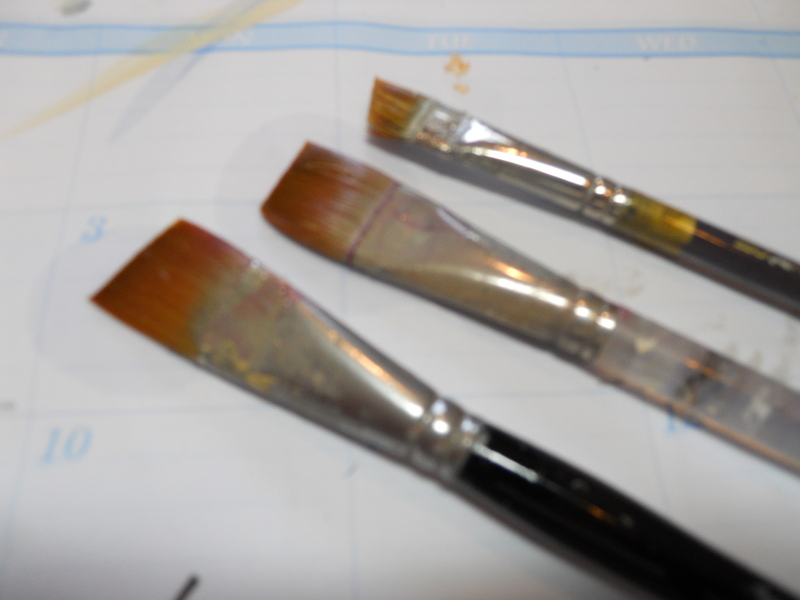 If your brushes look like this (yes, I’m hanging my head in shame) then it’s most definitely time to try and save them! 2.) 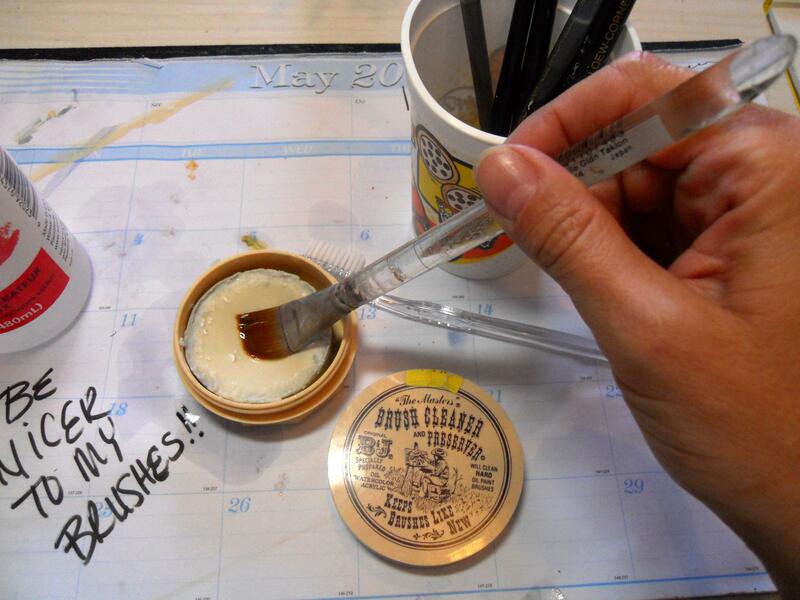 I really like this Brush Cleaner and Restorer by Windsor Newton. It doesn’t stink, and it’s water soluble. The best thing is that it works! 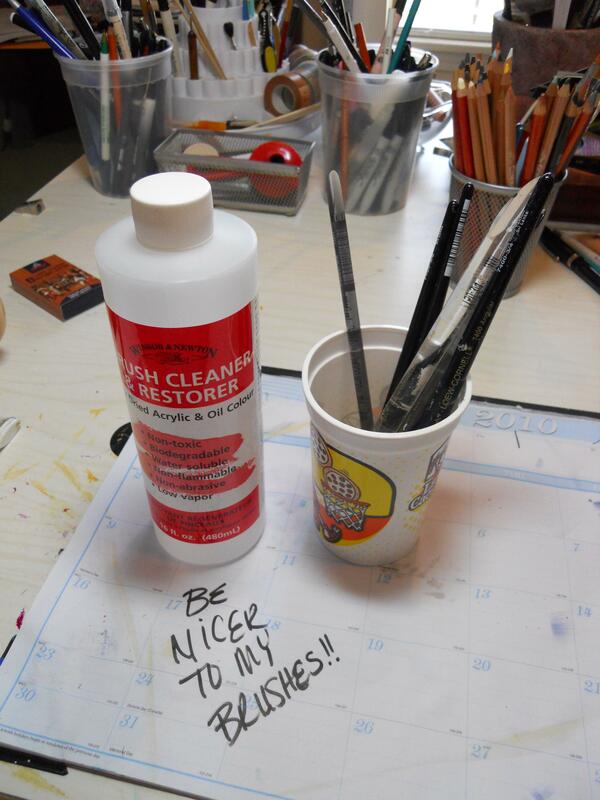 Use an old cup and put just enough of the cleaner in to cover the bristles and feral of the brushes. Don’t allow the the cleaner to cover the handle of the brush; it’ll ruin the painted wood! 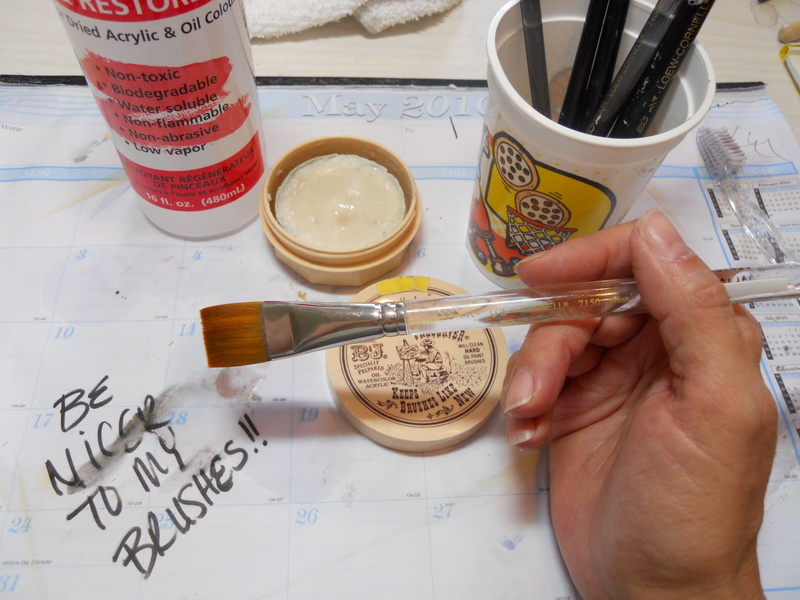 If your brushes are really dirty like mine, you’ll want to let them soak overnight. 3.) After their soak, take an old toothbrush and gently scrub out the old paint wiping the toothbrush from the feral out. Don’t go back and forth, just wipe away from the feral. 4.) 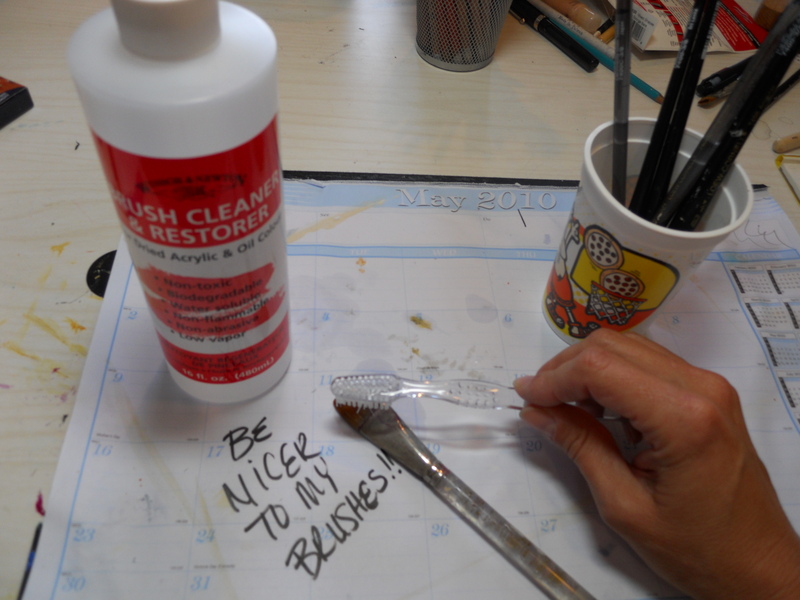 Rinse the brush and then wipe it across the Masters Brush Cleaner and Preserver several times and rinse again. 5.) Take the damp brush and run it across the Masters Brush Cleaner once on each side to put a thin coat that will dry keeping the bristles together and maintaining the chisle edge of the brush. This is important because the paint in the feral tends to splay the bristles and you need to put them back into the original state. Next time you use the brush you just rinse the dried soap out. 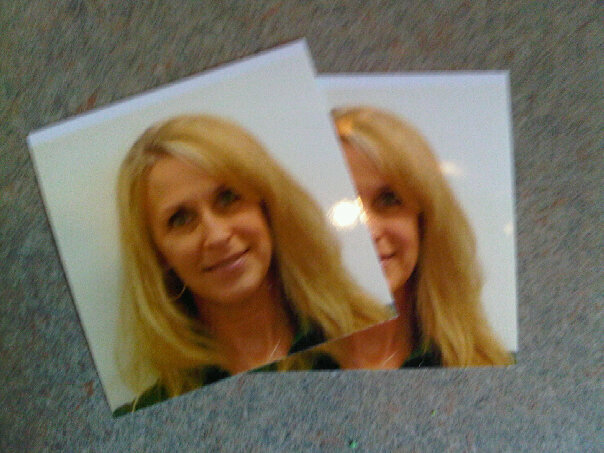 This week was a whirlwind of activity! There’s no rhyme or reason to all of it except that ART happens, so let’s take this on a day-by-day basis. 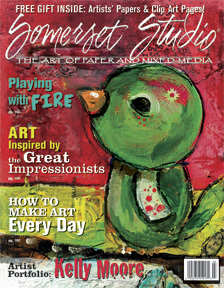 Monday– Got my advance copy of Somerset Studios with my ‘With One Palette’ article. They did an absolutely beautiful job with the layout. I’ve known for a little bit that this was coming but it didn’t seem real until I opened up the magazine and saw it for myself. I’m so honored to contribute to this wonderful publication on a regular basis and so very thankful for the opportunities that have unfolded these past couple of years. 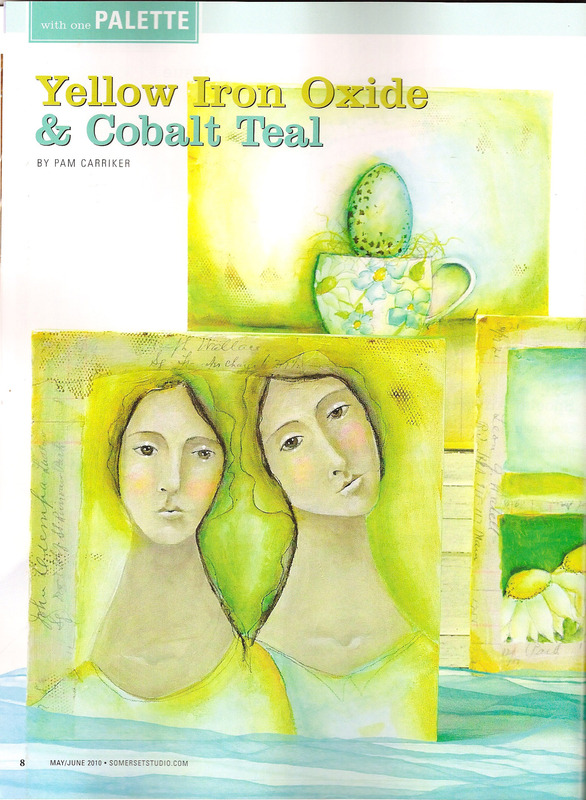 Tuesday-I finished an article for Artful Blogging! Thank you so much Orly and son for helping me get this new site all set up! Wednesday– Writing up the text and doing the step-outs for the next lesson in Journal 365 and hosted the first Live Chat that evening! It was great to get some one on one time with everyone. The next lesson starts May 1st if you’re interested in joining us! Thursday-Spent the day video taping the next workshop lesson and talking to Lisa Bebi and Renee Richetts about our upcoming workshop in PARIS!! Lisa and Renee also have articles in the current Somerset Studios, which was great unplanned timing as it coincided with the workshop announcement! Be sure to check out this super-packed issue! PARIS in DECEMBER! It’s been in the works for several months and are now finalizing the details. I’ll post the info as soon as we nail down the last bits. If you’re interested please send me an email and we will send you the information directly. Friday– I booked my ticket to Paris and spent the morning working on my accommodations; on the top of the list is an apartment that Modigliani stayed at! Can’t even begin to believe how cool that would be!! I love working towards a goal. 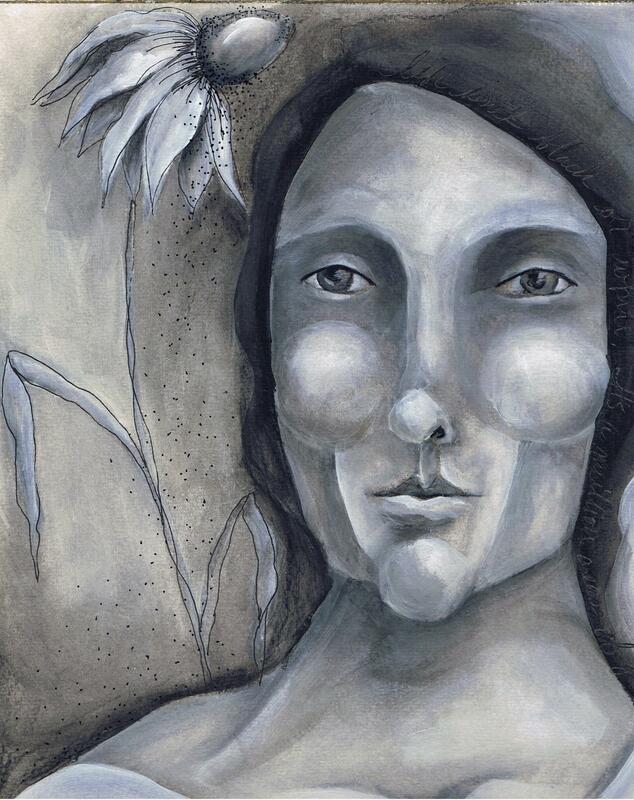 It invigorates and inspires me to try new things. One of my goals this year is to try to work in more live teaching venues. I have a couple in the works, one local and one abroad, more on that one later! There is one though that is a long time desire. To teach at Artfest. It’s literally right in the backyard of my old stomping grounds. Port Townsend is a short drive from my parents who now live year round at the place we went every summer. So I’m working on my proposal and I’m excited with the progress so far of the techniques I’ve been combining and experimenting with. 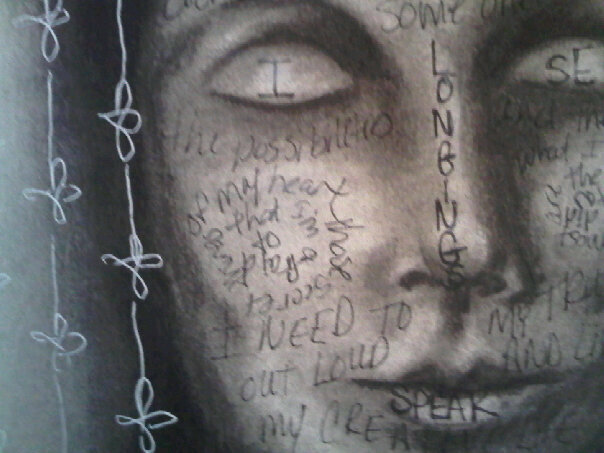 This is part of the thrill that comes with creating art. 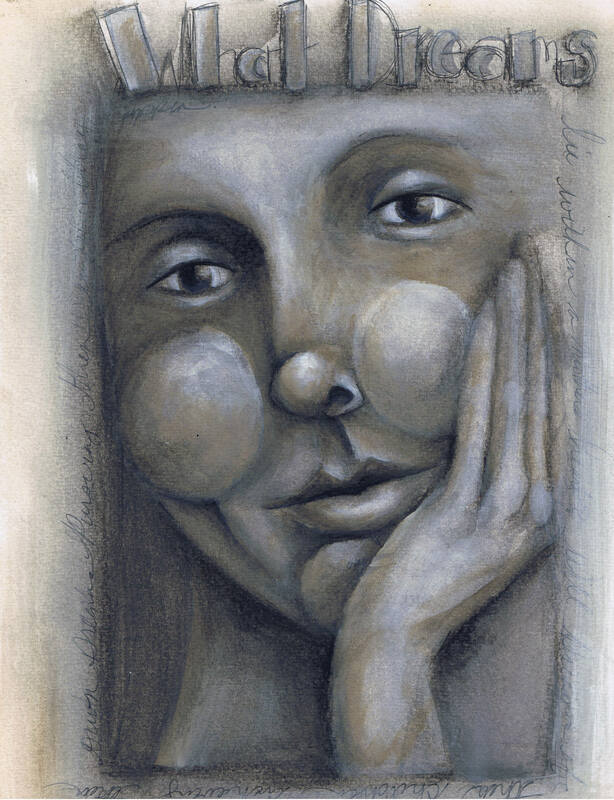 You can continually come up with new and exciting ways to use different mediums and apply them to your style of art. What are your goals this year? Have you started working towards them? Have you said them out loud? When you give them voice you’re more accountable and more likely to see them realized. I struggle daily with my mother’s heart as I watch my two oldest boys, one already off on his own and one making his plans to leave home and begin life on his own. The outward me tries to encourage them to spread their wings and embrace their independence, but on the inside I have to work at this while my heart clings to the image of the little boys that still needed their mom for everything. ‘Set Free’ shows the stepping stones that have been laid with their time at home that lead to the door of independence and the world outside of these four walls. The door is mirrored by a similar shaped hole in my heart.